I’ve only done actual Christmas caroling a handful of times in my life- but I remember that I loved it. One of the times I can clearly remember is when I was still in elementary school and the children’s choir went caroling to the governor’s mansion. It was a quiet, slightly snowy night and after we sang a few songs, I can remember being invited inside to a big beautiful ‘house’ where we got served hot chocolate, cookies and candy in a ‘study’ type of room with bright golden lights. As long as you don’t take yourself too seriously, don’t mind if 1 or 2 of the people in your group are off-key and love to laugh, then caroling is a blast. Plus, people usually give you free food as a way to say ‘thank you’. Everyone ‘s got their own favorite Christmas carols, and I’m no exception. However, my favorites have shifted throughout the years. Now I’m willing to admit that I just can’t pick one as my favorite. I’ve got several. Okay, more than that. When I was very young, around 5 or 6, my favorite Christmas carol was The First Noel. I loved the melody and would always hum the last part to myself, “Born is the King of Israel,” over and over again. Then when I was around 8 or 9, it was Silver Bells- but that was because at the time (mid 90’s), there was a commercial that would constantly come on at Christmas time with the Silver Bells melody playing in the background that I really liked. After that, I think it was Angels We Have Heard on High- although to be honest, I went YEARS without even knowing what some of the lyrics were because I was too young to understand that some of the lyrics were in Latin (“in excelsis deo IS Latin, right? Right??). Christmastime is Here was my favorite Christmas Carol in middle school; I heard it played once on the piano at a holiday party and just fell in love with it. That one’s still remained one of my favorites over the years, and I have a few versions of it on my playlist, including the Vince Guaraldi classic from A Charlie Brown Christmas. Honorable mentions should also go out to Give Love on Christmas Day, The Christmas Song, Hark the Herald Angels Sing, O Christmas Tree, O What a Merry Christmas Day, All I Want for Christmas Is You, and God Rest Ye Merry Gentlemen, Carol of the Bells. As many of them as I like, there are also other carols that I don’t really care for: I Saw Mommy Kissing Santa Claus, Little Drummer Boy, Silent Night, Jingle Bells, Rudolph the Red Nose Reindeer, Frosty the Snowman, and Away in a Manger. I guess I just don’t really like the ‘story’ Christmas carols all that much. Today’s recipe is super, super easy to put together, but still packs a great punch. 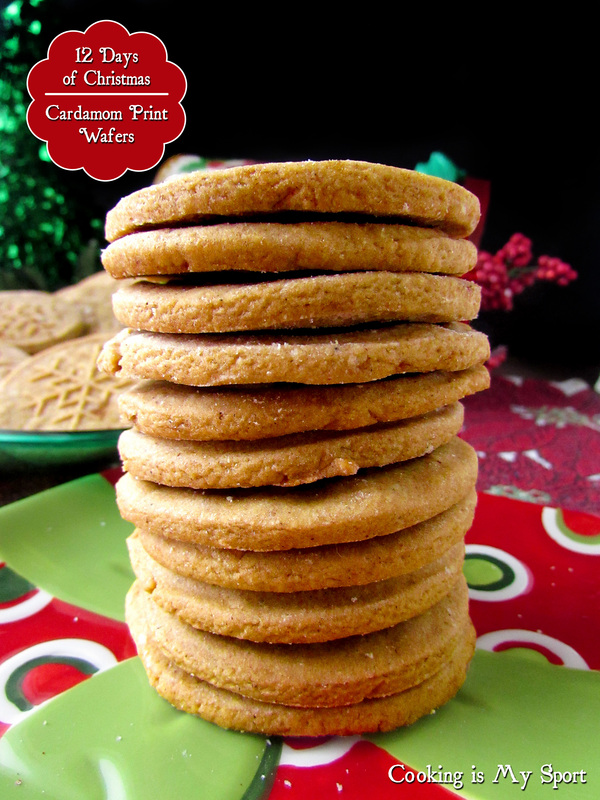 These cookies are thin, slightly crisp but still somewhat chewy in the centeer. The cardamom gives it a very unique spicy bite that combined with the cinnamon really reminds me of a delicious Speculoos biscuit. Hands down, these are meant to be enjoyed with a cup of coffee or tea. I decided to leave them plain and just let the design from the cookie stamps speak for themselves- these are honestly good enough to stand without icing or sprinkles. 1. Stir together flour, cardamom, cinnamon and salt. 2. In a small mixer bowl, beat til fluffy, Add egg and vanilla and beat well. 3. Stir in flour mixture till well mixed. Cover and chill about 2 hours, or preferably overnight. 4. Shape into 3/4 inch balls. Place 2 inches apart on a greased cookie sheet. 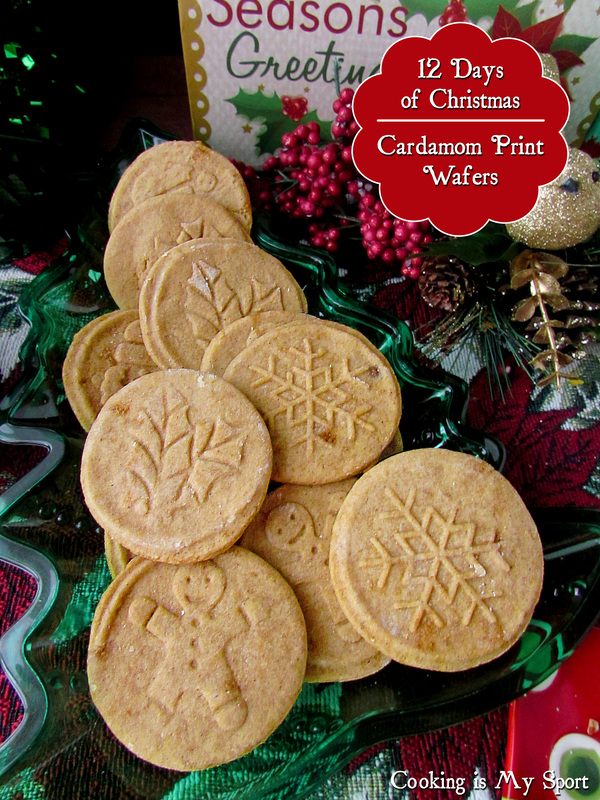 Flatten firmly with a floured cookie stamp or the bottom of a glass with a design in it. 5. Bake in a 350° oven about 8 minutes. Remove and cool. Hi Jess, Happy New Year. 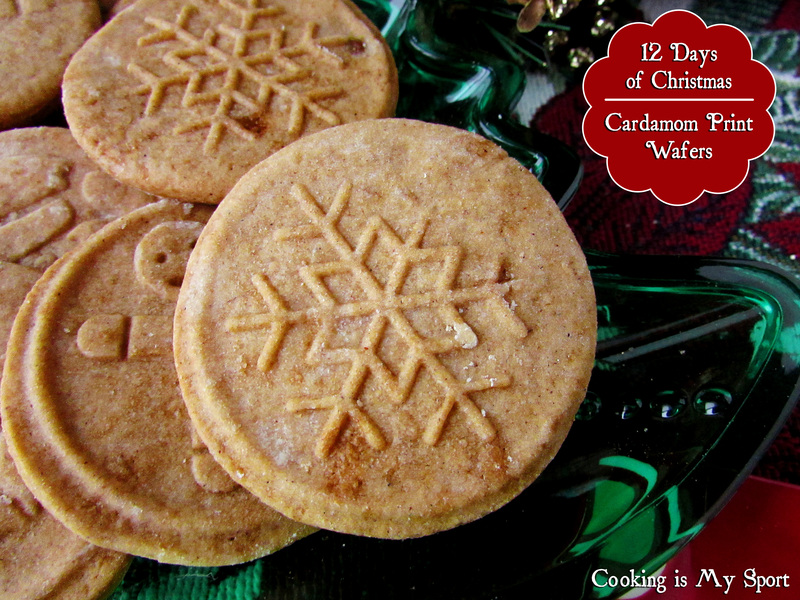 Thanks for visiting our blog and liking my post on Christmas shortbread and Dutch Speculaas – I hope it inspired you to try making something? 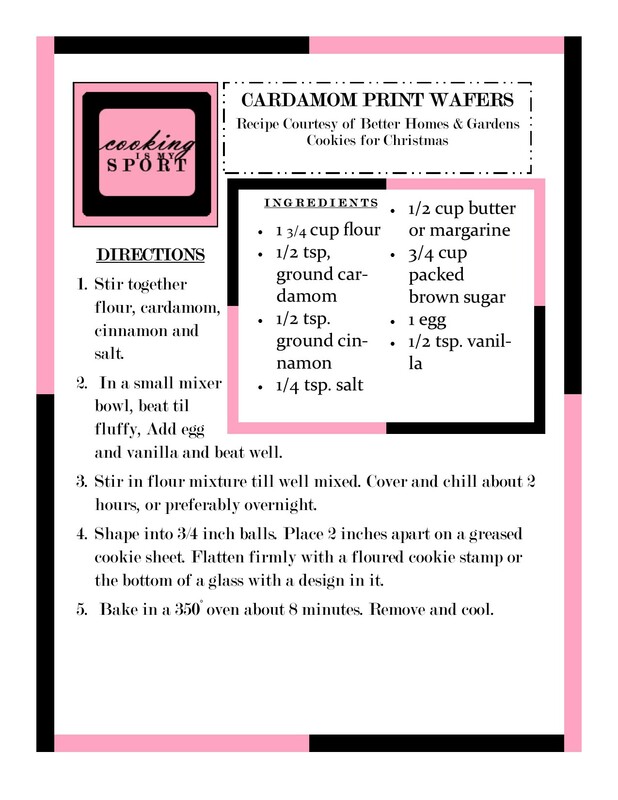 I love the look of these cardamon Wafers (one of my favourite spices!) but how did you get that fabulous snow-flake pattern in them? Dying to know. Happy New Year to you as well- getting the pattern on the cookies is really easy. 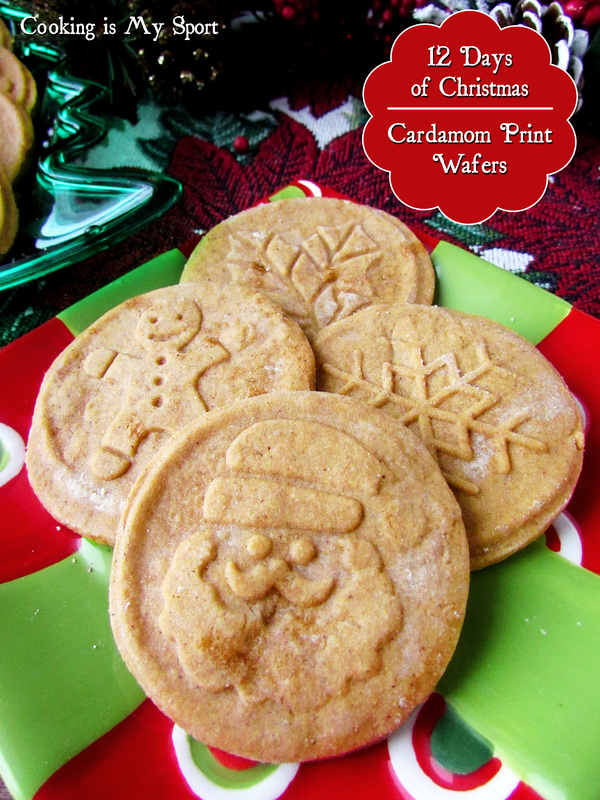 All you need is a plastic (or glass) cookie stamp with a design imprinted on it. 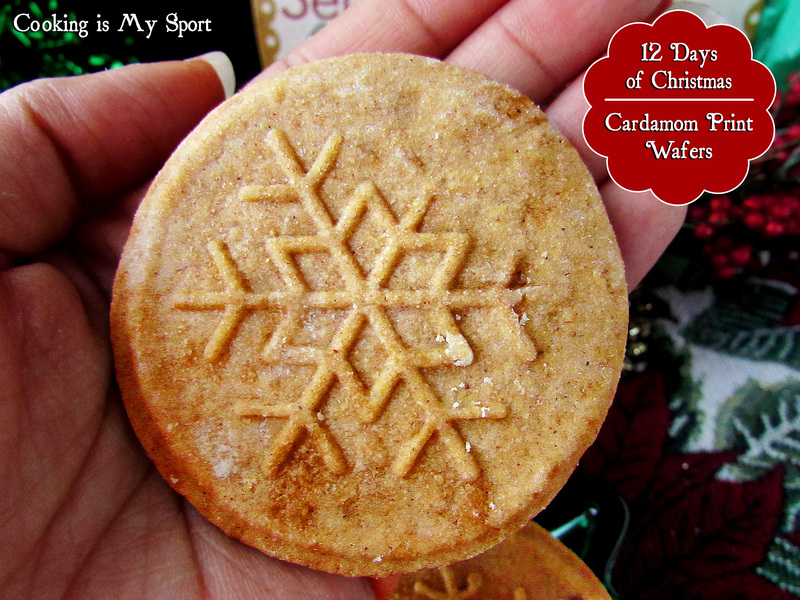 You roll out your cookie dough, cut out a circle, then press the cookie stamp on top. I’m pretty sure you could buy them in stores or online for more elaborate designs.